A templated base class for SmallPtrSet which provides the typesafe interface that is common across all small sizes. This is particularly useful for passing around between interface boundaries to avoid encoding a particular small size in the interface boundary. Definition at line 343 of file SmallPtrSet.h. Definition at line 360 of file SmallPtrSet.h. Definition at line 359 of file SmallPtrSet.h. Definition at line 361 of file SmallPtrSet.h. Definition at line 362 of file SmallPtrSet.h. Definition at line 350 of file SmallPtrSet.h. Definition at line 352 of file SmallPtrSet.h. Definition at line 355 of file SmallPtrSet.h. Definition at line 396 of file SmallPtrSet.h. Referenced by llvm::LoopVectorizationCostModel::collectValuesToIgnore(), llvm::compareLoops(), ComputeLiveInBlocks(), llvm::createObjCARCOptPass(), findBBsToSinkInto(), llvm::findPHICopyInsertPoint(), FindPredecessorAutoreleaseWithSafePath(), FindPredecessorRetainWithSafePath(), isEmptyFunction(), isProfitableChain(), mapBinOpcode(), matchPair(), okayForPHIOfOps(), PeepholePPC64ZExtGather(), llvm::ARMConstantPoolConstant::promotedGlobals(), setUsedInitializer(), sinkInstruction(), llvm::sinkRegion(), swapAntiDependences(), llvm::UnrollAndJamLoop(), and llvm::LLVMContextImpl::~LLVMContextImpl(). Definition at line 381 of file SmallPtrSet.h. Referenced by addEdge(), llvm::CodeMetrics::analyzeBasicBlock(), analyzeLoopUnrollCost(), llvm::RecurrenceDescriptor::areAllUsesIn(), llvm::MemoryDepChecker::areDepsSafe(), AreSequentialAccesses(), llvm::LoopVectorizationLegality::blockNeedsPredication(), bothUsedInPHI(), buildClonedLoops(), llvm::ForwardDominanceFrontierBase< BasicBlock >::calculate(), canMoveInstsAcrossMemOp(), CanPropagatePredecessorsForPHIs(), checkForCyclesHelper(), collectCastsToIgnore(), collectMDInDomain(), collectValuesToDemote(), llvm::DomTreeNodeBase< VPBlockBase >::compare(), llvm::compareLoops(), completeEphemeralValues(), ComputeLiveInBlocks(), llvm::computeMinimumValueSizes(), ComputePostOrders(), llvm::ComputeSpeculationCost(), computeUnlikelySuccessors(), llvm::WebAssemblyException::contains(), llvm::LoopBase< BasicBlock, Loop >::contains(), llvm::containsIrreducibleCFG(), llvm::createCodeGenPreparePass(), llvm::createLowerSwitchPass(), llvm::createMemDerefPrinter(), deleteDeadBlocksFromLoop(), deleteIfDead(), llvm::denormalizeForPostIncUse(), determinePointerReadAttrs(), llvm::LiveRangeEdit::didRematerialize(), DominatesMergePoint(), doPromotion(), llvm::GVNExpression::Expression::dump(), llvm::SMSchedule::earliestCycleInChain(), findBestInsertionSet(), llvm::FindFunctionBackedges(), llvm::findPHICopyInsertPoint(), findProfitablePHIs(), FoldTwoEntryPHINode(), generateEquivalentSub(), getChainID(), getCoroBeginPredBlocks(), getDepthOfOptCmov(), getEarliestInsertPos(), getInnermostLoopFor(), getInputChainForNode(), getLatestInsertPos(), getLayoutSuccessorProbThreshold(), getMatchingEHPad(), getMemSetPatternValue(), getNarrowIntrinsic(), getNotRelocatableInstructions(), llvm::AArch64InstrInfo::getOutliningType(), GetPointerOperand(), getRegClassForUnfoldedLoad(), getSetupCost(), getSignature(), getStartOrEndSlot(), getSubprogram(), getSuccPad(), getTrueOrFalseValue(), getTypePartition(), getUnwindDestToken(), llvm::slpvectorizer::BoUpSLP::getVectorElementSize(), hasCallsInBlocksBetween(), llvm::RecurrenceDescriptor::hasMultipleUsesOf(), llvm::hasOutsideLoopUser(), llvm::SDNode::hasPredecessorHelper(), hasSameSuccessors(), INITIALIZE_PASS(), InsertRootInitializers(), instrumentMaskedLoadOrStore(), llvm::PreservedAnalyses::intersect(), llvm::intersectAccessGroups(), llvm::Loop::isAnnotatedParallel(), llvm::SparseSolver< LatticeKey, LatticeVal, KeyInfo >::isBlockExecutable(), isCallerPreservedOrConstPhysReg(), isDbgValueDescribedByReg(), isEFLAGSLive(), isEphemeralValueOf(), llvm::IVUsers::isIVUserOrOperand(), llvm::LiveVariables::isLiveOut(), isLoadConditional(), isLocalCopy(), llvm::isPotentiallyReachableFromMany(), isProfitableToFoldUnconditional(), IsSafeAndProfitableToMove(), isSafeToSpeculatePHIUsers(), llvm::isSafeToUnrollAndJam(), isSimplifiedLoopNest(), isSuccOrder(), isSupportedGuardInstruction(), isUnmergeableGlobal(), llvm::SMSchedule::latestCycleInChain(), llvm::SelectionDAG::LegalizeOp(), LinearizeExprTree(), LowerInterruptReturn(), mapBinOpcode(), MarkBlocksLiveIn(), matchPair(), mayLoopAccessLocation(), mayUsePostIncMode(), mbbHasBackEdge(), moveHeaderPhiOperandsToForeBlocks(), llvm::normalizeForPostIncUse(), llvm::MemorySSA::OptimizeUses::optimizeUses(), llvm::PreservedAnalyses::PreservedAnalysisChecker::preserved(), llvm::PreservedAnalyses::PreservedAnalysisChecker::preservedSet(), llvm::AlignmentFromAssumptionsPass::processAssumption(), processHeaderPhiOperands(), promoteSingleBlockAlloca(), recomputeLoopBlockSet(), recordConditions(), regOverlapsSet(), llvm::removeUnreachableBlocks(), rewriteDebugUsers(), llvm::LoopFullUnrollPass::run(), llvm::ModuleToPostOrderCGSCCPassAdaptor< CGSCCPassT >::run(), runImpl(), llvm::JumpThreadingPass::runImpl(), llvm::Localizer::runOnMachineFunction(), SafeToMergeTerminators(), setUsedInitializer(), shouldInstrumentReadWriteFromAddress(), simplifyLoopInst(), llvm::JumpThreadingPass::SimplifyPartiallyRedundantLoad(), sink(), SinkCommonCodeFromPredecessors(), llvm::sinkRegion(), AllocaSlices::SliceBuilder::SliceBuilder(), llvm::InstCombiner::SliceUpIllegalIntegerPHI(), speculatePHIs(), StripSymbolNames(), tryToElideArgumentCopy(), tryToVectorizeHorReductionOrInstOperands(), llvm::UnrollAndJamLoop(), llvm::MemorySSAUpdater::updateForClonedLoop(), updatePostorderSequenceForEdgeInsertion(), llvm::AssumptionCacheTracker::verifyAnalysis(), llvm::MemorySSA::verifyDominationNumbers(), llvm::LoopBase< BasicBlock, Loop >::verifyLoop(), and llvm::VPlanHCFGTransforms::VPInstructionsToVPRecipes(). Definition at line 401 of file SmallPtrSet.h. Referenced by llvm::LoopVectorizationCostModel::calculateRegisterUsage(), llvm::LoopVectorizationPlanner::collectTriviallyDeadInstructions(), llvm::LoopVectorizationCostModel::collectValuesToIgnore(), llvm::compareLoops(), ComputeLiveInBlocks(), findBBsToSinkInto(), isEmptyFunction(), isProfitableChain(), mapBinOpcode(), llvm::LoopVectorizationCostModel::memoryInstructionCanBeWidened(), okayForPHIOfOps(), PeepholePPC64ZExtGather(), llvm::ARMConstantPoolConstant::promotedGlobals(), setUsedInitializer(), sinkInstruction(), swapAntiDependences(), llvm::InnerLoopVectorizer::truncateToMinimalBitwidths(), llvm::VPRecipeBuilder::tryToCreateRecipe(), and llvm::InnerLoopVectorizer::updateAnalysis(). erase - If the set contains the specified pointer, remove it and return true, otherwise return false. Definition at line 377 of file SmallPtrSet.h. Referenced by addSegmentsWithValNo(), llvm::ARMFrameLowering::adjustForSegmentedStacks(), buildClonedLoops(), llvm::LoopVectorizationCostModel::calculateRegisterUsage(), checkForCyclesHelper(), computeFunctionSummary(), ComputePostOrders(), llvm::createConstantPropagationPass(), llvm::FindFunctionBackedges(), llvm::slpvectorizer::BoUpSLP::getSpillCost(), hasCallsInBlocksBetween(), intersect(), isEFLAGSLive(), isEmptyFunction(), isVirtualRegisterOperand(), llvm::SelectionDAG::Legalize(), matchPair(), llvm::LanaiInstrInfo::optimizeSelect(), llvm::ARMBaseInstrInfo::optimizeSelect(), patchAndReplaceAllUsesWith(), rebuildLoopAfterUnswitch(), llvm::LoopBase< BasicBlock, Loop >::removeBlockFromLoop(), llvm::InterleavedAccessInfo::requiresScalarEpilogue(), setUsedInitializer(), llvm::sinkRegion(), swapAntiDependences(), llvm::UnrollAndJamLoop(), llvm::MemorySSA::verifyDominationNumbers(), and llvm::LLVMContext::~LLVMContext(). Definition at line 382 of file SmallPtrSet.h. Referenced by llvm::LoopVectorizationCostModel::calculateRegisterUsage(), llvm::LoopVectorizationPlanner::collectTriviallyDeadInstructions(), llvm::SyncDependenceAnalysis::join_blocks(), llvm::LoopVectorizationCostModel::memoryInstructionCanBeWidened(), llvm::InnerLoopVectorizer::truncateToMinimalBitwidths(), llvm::VPRecipeBuilder::tryToCreateRecipe(), and llvm::InnerLoopVectorizer::updateAnalysis(). 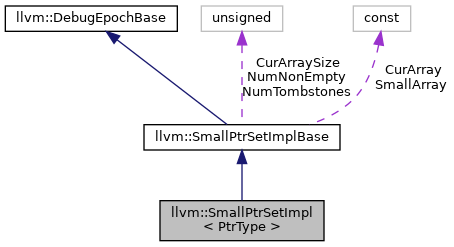 The bool component of the returned pair is true if and only if the insertion takes place, and the iterator component of the pair points to the element equal to Ptr. Definition at line 370 of file SmallPtrSet.h. Referenced by AddAliasScopeMetadata(), llvm::WebAssemblyException::addBlock(), llvm::LoopBase< BasicBlock, Loop >::addBlockEntry(), addEdge(), llvm::VPlan::addExternalDef(), AddReachableCodeToWorklist(), llvm::cl::Option::addSubCommand(), llvm::IVUsers::AddUsersImpl(), llvm::ARMFrameLowering::adjustForSegmentedStacks(), llvm::PreservedAnalyses::all(), llvm::LoopSafetyInfo::allLoopPathsLeadToBlock(), allPhiOperandsUndefined(), AllUsesOfValueWillTrapIfNull(), analyzeGlobalAux(), appendSpeculatableOperands(), appendToUsedList(), llvm::MemorySSAUpdater::applyInsertUpdates(), llvm::MemoryDepChecker::areDepsSafe(), AreSequentialAccesses(), llvm::LoopVectorizationLegality::blockNeedsPredication(), buildClonedLoopBlocks(), buildClonedLoops(), llvm::buildModuleSummaryIndex(), buildMultiplyTree(), llvm::IDFCalculator< NodeTy, IsPostDom >::calculate(), llvm::ForwardDominanceFrontierBase< BasicBlock >::calculate(), calculateByteProvider(), llvm::LoopVectorizationCostModel::calculateRegisterUsage(), callsiteIsHot(), canFoldInAddressingMode(), canMoveInstsAcrossMemOp(), canonicalizePHIOperands(), canPaddingBeAccessed(), canTrapImpl(), canTRE(), castRequiresQueuePtr(), checkForCyclesHelper(), CloneLoop(), collectCastsToIgnore(), llvm::collectCmpOps(), llvm::CodeMetrics::collectEphemeralValues(), collectHomogenousInstGraphLoopInvariants(), collectMDInDomain(), collectTransitivePredecessors(), llvm::LoopVectorizationPlanner::collectTriviallyDeadInstructions(), llvm::collectUsedGlobalVariables(), CombineBaseUpdate(), llvm::DomTreeNodeBase< VPBlockBase >::compare(), llvm::FunctionComparator::compare(), completeEphemeralValues(), llvm::ObjectSizeOffsetEvaluator::compute(), computeFunctionSummary(), llvm::DivergencePropagator::computeJoinPoints(), ComputeLiveInBlocks(), llvm::computeMinimumValueSizes(), llvm::slpvectorizer::BoUpSLP::computeMinimumValueSizes(), computePath(), ComputePostOrders(), llvm::ComputeSpeculationCost(), computeUnlikelySuccessors(), ConstHasGlobalValuePredicate(), contains(), llvm::containsIrreducibleCFG(), containsNewBackedge(), llvm::ScalarEvolution::convertSCEVToAddRecWithPredicates(), ConvertToSInt(), llvm::MachineBasicBlock::CorrectExtraCFGEdges(), llvm::createAMDGPUFunctionInliningPass(), llvm::createCodeGenPreparePass(), llvm::createConstantPropagationPass(), llvm::createMemDerefPrinter(), createSegmentsForValues(), DeadPHICycle(), definesFullReg(), deleteDeadBlocksFromLoop(), llvm::deleteDeadLoop(), despeculateCountZeros(), llvm::DetatchDeadBlocks(), determinePointerReadAttrs(), llvm::AsmPrinter::doFinalization(), DominatesMergePoint(), llvm::GVNExpression::Expression::dump(), llvm::SMSchedule::earliestCycleInChain(), llvm::AsmPrinter::EmitJumpTableInfo(), llvm::LazyValueInfo::enableDT(), llvm::Evaluator::EvaluateFunction(), llvm::CodeExtractor::extractCodeRegion(), llvm::FastISel::fastEmitZExtFromI1(), llvm::DIBuilder::finalize(), FindAllMemoryUses(), findBBsToSinkInto(), llvm::objcarc::FindDependencies(), llvm::FindFunctionBackedges(), llvm::HexagonInstrInfo::findLoopInstr(), findNonImmUse(), findPartitions(), llvm::findPHICopyInsertPoint(), findProfitablePHIs(), findRefEdges(), llvm::DomTreeBuilder::SemiNCAInfo< DomTreeT >::FindRoots(), FindUsedValues(), findUsedValues(), findUses(), fixupRegionExits(), forEachUser(), llvm::ScalarEvolution::forgetLoop(), llvm::ScalarEvolution::forgetValue(), llvm::formDedicatedExitBlocks(), llvm::FunctionComparator::functionHash(), llvm::StackSafetyInfo::FunctionInfo::FunctionInfo(), FunctionNumber(), generateEquivalentSub(), getAdjustedPtr(), getChainID(), GetConstantInt(), getCoroBeginPredBlocks(), getDepthOfOptCmov(), llvm::BasicTTIImplBase< AMDGPUTTIImpl >::getEstimatedNumberOfCaseClusters(), getFirstNonAllocaInTheEntryBlock(), getInnermostLoopFor(), getInputChainForNode(), getLAScore(), getLayoutSuccessorProbThreshold(), llvm::LexicalScopes::getMachineBasicBlocks(), getMatchingEHPad(), getMemSetPatternValue(), llvm::DILocation::getMergedLocation(), llvm::GlobalsAAResult::getModRefBehavior(), getNarrowIntrinsic(), getNewSource(), llvm::MemoryDependenceResults::getNonLocalCallDependency(), getNotRelocatableInstructions(), llvm::BasicTTIImplBase< AMDGPUTTIImpl >::getOperandsScalarizationOverhead(), getOutliningPenalty(), llvm::GetPointerBaseWithConstantOffset(), GetPointerOperand(), getRangeForAffineARHelper(), getRegClassForUnfoldedLoad(), llvm::SCEVExpander::getRelatedExistingExpansion(), getRetpolineSymbol(), getSetupCost(), getSignature(), llvm::slpvectorizer::BoUpSLP::getSpillCost(), getStartOrEndSlot(), GetStringLengthH(), getSubprogram(), getSuccPad(), llvm::slpvectorizer::BoUpSLP::getTreeCost(), getTypePartition(), llvm::GetUnderlyingObjects(), llvm::getUnderlyingObjectsForCodeGen(), getUnwindDestToken(), llvm::slpvectorizer::BoUpSLP::getVectorElementSize(), llvm::ScalarEvolution::getWrapPredicate(), greaterWithBias(), llvm::guessSuccessors(), HandleInlinedLandingPad(), HandleMergeInputChains(), hasCallsInBlocksBetween(), hasConcreteDef(), hasConcreteDefImpl(), llvm::ScalarEvolution::hasOperand(), llvm::SDNode::hasPredecessorHelper(), hasRegisterDependency(), hasSameExtUse(), INITIALIZE_PASS(), llvm::PMTopLevelManager::initializeAllAnalysisInfo(), llvm::MemorySSAUpdater::insertDef(), llvm::LazyCallGraph::RefSCC::insertIncomingRefEdge(), InsertRootInitializers(), instrumentMaskedLoadOrStore(), llvm::PhiValues::invalidate(), llvm::InterleavedAccessInfo::invalidateGroupsRequiringScalarEpilogue(), inversePermutation(), isAlwaysFoldable(), llvm::LazyCallGraph::SCC::isAncestorOf(), llvm::LazyCallGraph::RefSCC::isAncestorOf(), llvm::Loop::isAnnotatedParallel(), isBlockValidForExtraction(), isBroadcastShuffle(), isCallerPreservedOrConstPhysReg(), llvm::CoalescerPair::isCoalescable(), isDefInSubRange(), isDereferenceableAndAlignedPointer(), isEFLAGSLive(), isEmptyFunction(), isEphemeralValueOf(), isHighCostExpansion(), IsIncrementNUW(), isKnownNonNullFromDominatingCondition(), llvm::LiveVariables::isLiveOut(), isLoadConditional(), isNonEscapingGlobalNoAliasWithLoad(), IsNonLocalValue(), isObjectSizeLessThanOrEq(), llvm::isPotentiallyReachableFromMany(), isProfitableChain(), IsSafeAndProfitableToMove(), isSafeAndProfitableToSpeculateAroundPHI(), isSafeToMove(), isSafeToSpeculatePHIUsers(), IsScalarTBAANodeImpl(), isSimpleEnoughValueToCommit(), isSimplifiedLoopNest(), llvm::StructType::isSized(), IsStoredObjCPointer(), isSuccOrder(), isSupportedGuardInstruction(), isUnconditionalBranch(), llvm::LoopVectorizationLegality::isUniform(), isUniformlyReached(), isVectorReductionOp(), isVirtualRegisterOperand(), isZero(), iterativelySimplifyCFG(), llvm::SMSchedule::latestCycleInChain(), llvm::LazyCallGraph::LazyCallGraph(), llvm::SelectionDAG::Legalize(), llvm::SelectionDAG::LegalizeOp(), LinearizeExprTree(), LoadUsesSimpleEnoughForHeapSRA(), lookThroughAnd(), llvm::LoopBase< BasicBlock, Loop >::LoopBase(), LowerInterruptReturn(), mapBinOpcode(), markAliveBlocks(), MarkBlocksLiveIn(), llvm::ARMFunctionInfo::markGlobalAsPromotedToConstantPool(), llvm::LiveRangeEdit::markRematerialized(), matchPair(), mayLoopAccessLocation(), mayUsePostIncMode(), llvm::LoopVectorizationCostModel::memoryInstructionCanBeWidened(), memoryIsNotModifiedBetween(), MergeAliasResults(), mergeConditionalStores(), mergeInlinedArrayAllocas(), mergeOperations(), llvm::SelectionDAG::MorphNodeTo(), okayForPHIOfOps(), NewGVN::ValueDFS::operator<(), optimizeGlobalsInModule(), llvm::LanaiInstrInfo::optimizeSelect(), llvm::ARMBaseInstrInfo::optimizeSelect(), llvm::MemorySSA::OptimizeUses::optimizeUses(), partitionOuterLoopBlocks(), patchAndReplaceAllUsesWith(), PeepholePPC64ZExtGather(), performNEONPostLDSTCombine(), performPostLD1Combine(), PHIsEqualValue(), llvm::AlignmentFromAssumptionsPass::processAssumption(), promoteArguments(), promoteSingleBlockAlloca(), PushDefUseChildren(), pushIVUsers(), PushLoopPHIs(), rebuildLoopAfterUnswitch(), recomputeLoopBlockSet(), recordConditions(), llvm::RecursivelyDeleteDeadPHINode(), ReduceSwitchRange(), regOverlapsSet(), RemoveDeadConstant(), removePhis(), llvm::removeUnreachableBlocks(), llvm::LiveRange::RenumberValues(), llvm::ARMTargetLowering::ReplaceNodeResults(), llvm::InterleavedAccessInfo::requiresScalarEpilogue(), llvm::InterleavedAccessInfo::reset(), llvm::SSAUpdaterBulk::RewriteAllUses(), rewriteDebugUsers(), llvm::LoopPredicationPass::run(), llvm::LoopFullUnrollPass::run(), runImpl(), llvm::JumpThreadingPass::runImpl(), llvm::Localizer::runOnMachineFunction(), scalarizeBinOpOfBuildVectors(), setBranchWeights(), llvm::LoopVectorizationCostModel::setCostBasedWideningDecision(), llvm::MCAssembler::setIsThumbFunc(), setUsedInitializer(), shouldInstrumentReadWriteFromAddress(), ShrinkLoadReplaceStoreWithStore(), simplifyDivRem(), simplifyLoopInst(), simplifyOneLoop(), llvm::JumpThreadingPass::SimplifyPartiallyRedundantLoad(), sink(), SinkCommonCodeFromPredecessors(), sinkInstruction(), llvm::sinkRegion(), AllocaSlices::SliceBuilder::SliceBuilder(), llvm::InstCombiner::SliceUpIllegalIntegerPHI(), sortOpts(), speculatePHIs(), llvm::Value::stripAndAccumulateInBoundsConstantOffsets(), stripAndComputeConstantOffsets(), truncateIVUse(), llvm::InnerLoopVectorizer::truncateToMinimalBitwidths(), tryToElideArgumentCopy(), TryToMergeLandingPad(), tryToVectorizeHorReductionOrInstOperands(), turnGuardIntoBranch(), llvm::UnrollAndJamLoop(), unswitchAllTrivialConditions(), unswitchBestCondition(), llvm::LiveIntervals::HMEditor::updateAllRanges(), llvm::InnerLoopVectorizer::updateAnalysis(), updateCallerBFI(), updateForIncomingValueLocation(), updateLiveness(), ValueIsOnlyUsedLocallyOrStoredToOneGlobal(), llvm::AssumptionCacheTracker::verifyAnalysis(), llvm::LoopBase< BasicBlock, Loop >::verifyLoop(), llvm::sroa::AllocaSliceRewriter::visit(), visitDomSubTree(), llvm::InstCombiner::visitLandingPadInst(), llvm::InstCombiner::visitPHINode(), llvm::LazyCallGraph::visitReferences(), llvm::DivergencePropagator::visitSuccessor(), llvm::TBAAVerifier::visitTBAAMetadata(), llvm::VirtRegAuxInfo::weightCalcHelper(), llvm::LLVMContext::~LLVMContext(), llvm::PredicateInfo::~PredicateInfo(), and llvm::VPInterleavedAccessInfo::~VPInterleavedAccessInfo(). Definition at line 387 of file SmallPtrSet.h. Definition at line 392 of file SmallPtrSet.h.